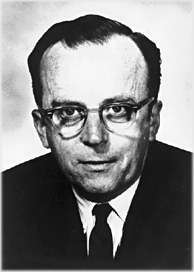 Joseph Carl Robnett Licklider (/ˈlɪklaɪdər/; March 11, 1915 – June 26, 1990), known simply as J. C. R. or "Lick", was an American psychologist and computer scientist who is considered one of the most important figures in computer science and general computing history. He is particularly remembered for being one of the first to foresee modern-style interactive computing and its application to all manner of activities; and also as an Internet pioneer with an early vision of a worldwide computer network long before it was built. He did much to actually initiate this by funding research which led to much of it, including today's canonical graphical user interface, and the ARPANET, the direct predecessor to the Internet. He has been called "computing's Johnny Appleseed", for planting the seeds of computing in the digital age; Robert Taylor, founder of Xerox PARC's Computer Science Laboratory and Digital Equipment Corporation's Systems Research Center, noted that "most of the significant advances in computer technology—including the work that my group did at Xerox PARC—were simply extrapolations of Lick's vision. They were not really new visions of their own. So he was really the father of it all". "More than a decade will pass before personal computers emerge from the garages of Silicon Valley, and a full thirty years before the Internet explosion of the 1990s. The word computer still has an ominous tone, conjuring up the image of a huge, intimidating device hidden away in an over-lit, air-conditioned basement, relentlessly processing punch cards for some large institution: them. "Yet, sitting in a nondescript office in McNamara's Pentagon, a quiet...civilian is already planning the revolution that will change forever the way computers are perceived. Somehow, the occupant of that office...has seen a future in which computers will empower individuals, instead of forcing them into rigid conformity. He is almost alone in his conviction that computers can become not just super-fast calculating machines, but joyful machines: tools that will serve as new media of expression, inspirations to creativity, and gateways to a vast world of online information." Licklider was born on March 11, 1915, in St. Louis, Missouri, US. He was the only child of Joseph Parron Licklider, a Baptist minister, and Margaret Robnett Licklider. Despite his father's religious background, he was not religious in later life. He studied at Washington University in St. Louis, where he received a triple bachelor of arts degree in 1937, in physics, mathematics, and psychology, and a master of arts degree in psychology in 1938. He received a PhD in psychoacoustics from the University of Rochester in 1942, and worked at the Psycho-Acoustic Laboratory at Harvard University from 1943 to 1950. He became interested in information technology, and moved to MIT in 1950 as an associate professor, where he served on a committee that established MIT Lincoln Laboratory and a psychology program for engineering students. While at MIT Licklider was involved in the SAGE project, in the capacity of head of the team concerned with human factors. In 1957 he received the Franklin V. Taylor Award from the Society of Engineering Psychologists. In 1958 he was elected President of the Acoustical Society of America, and in 1990 he received the Commonwealth Award for Distinguished Service. In 1957 he became a Vice President at Bolt Beranek and Newman, Inc., where he bought the first production PDP-1 computer and conducted the first public demonstration of time-sharing. In October 1962, Licklider was appointed head of the Information Processing Techniques Office (IPTO) at DARPA, the United States Department of Defense Advanced Research Projects Agency, an appointment he kept until sometime during 1964. In 1963 he was named Director of Behavioral Sciences Command & Control Research at ARPA. In April of that year, he sent a memo to his colleagues in outlining the early challenges presented in establishing a time-sharing network of computers with the software of the era. Ultimately, his vision led to ARPANet, the precursor of today's Internet. In 1968 J. C. R. Licklider became director of Project MAC at MIT, and a professor in the Department of Electrical Engineering. Project MAC had produced the first computer time-sharing system, CTSS, and one of the first online setups with the development of Multics (work on which commenced in 1964). Multics provided inspiration for some elements of the Unix operating system developed at Bell Labs by Ken Thompson and Dennis Ritchie in 1970. He retired and became Professor Emeritus in 1985. He died in 1990 in Arlington, Massachusetts. In the psychoacoustics field, Licklider is most remembered for his 1951 "Duplex Theory of Pitch Perception", presented in a paper that has been cited hundreds of times, was reprinted in a 1979 book, and formed the basis for modern models of pitch perception. While at MIT in the 1950s, Licklider worked on "SAGE" (Semi-Automatic Ground Environment), a Cold War project to create a computer-aided air defense system. The SAGE system included computers that collected and presented data to a human operator, who then chose the appropriate response. Licklider worked as a human factors expert, which helped convince him of the great potential for human/computer interfaces. Licklider became interested in information technology early in his career. His ideas foretold of graphical computing, point-and-click interfaces, digital libraries, e-commerce, online banking, and software that would exist on a network and migrate wherever it was needed. Much like Vannevar Bush's, Licklider's contribution to the development of the Internet consists of ideas, not inventions. He foresaw the need for networked computers with easy user interfaces. Licklider was instrumental in conceiving, funding and managing the research that led to modern personal computers and the Internet. In 1960 his seminal paper on "Man-Computer Symbiosis" foreshadowed interactive computing, and he went on to fund early efforts in time-sharing and application development, most notably the work of Douglas Engelbart, who founded the Augmentation Research Center at Stanford Research Institute and created the famous On-Line System where the computer mouse was invented. He also did some seminal early work for the Council on Library Resources, imagining what libraries of the future might look like, which he had described as "thinking centers" in his 1960 paper. In "Man-Computer Symbiosis", Licklider outlined the need for simpler interaction between computers and computer users. Licklider has been credited as an early pioneer of cybernetics and artificial intelligence (AI), but unlike many AI practitioners, Licklider never felt that men would be replaced by computer-based beings. As he wrote in that article: "Men will set the goals, formulate the hypotheses, determine the criteria, and perform the evaluations. Computing machines will do the routinizable work that must be done to prepare the way for insights and decisions in technical and scientific thinking". This approach, focusing on effective use of information technology in augmenting human intelligence, is sometimes called Intelligence amplification (IA). During his time as director of ARPA's Information Processing Techniques Office (IPTO) from 1962 to 1964, he funded Project MAC at MIT where a large mainframe computer was designed to be shared by up to 30 simultaneous users, each sitting at a separate "typewriter terminal". He also funded similar projects at Stanford University, UCLA, UC Berkeley, and the AN/FSQ-32 at System Development Corporation. In 1964, Licklider left IPTO and went to work at IBM. In 1968, he went back to MIT to lead Project MAC. Licklider played a similar role in conceiving of and funding early networking research, most notably the ARPAnet. He formulated the earliest ideas of a global computer network in August 1962 at BBN, in a series of memos discussing the "Intergalactic Computer Network" concept. These ideas contained almost everything that the Internet is today, including cloud computing. While at IPTO, he convinced Ivan Sutherland, Bob Taylor, and Lawrence G. Roberts that an all-encompassing computer network was a very important concept. In 1967 Licklider submitted the paper "Televistas: Looking ahead through side windows" to the Carnegie Commission on Educational Television. This paper describes a radical departure from the "broadcast" model of television. Instead, Licklider advocates a two-way communications network. The Carnegie Commission led to the creation of the Corporation for Public Broadcasting. Although the Commission's report explains that "Dr. Licklider's paper was completed after the Commission had formulated its own conclusions," President Johnson said at the signing of the Public Broadcasting Act of 1967, "So I think we must consider new ways to build a great network for knowledge-not just a broadcast system, but one that employs every means of sending and of storing information that the individual can use". His 1968 paper The Computer as a Communication Device illustrates his vision of network applications and predicts the use of computer networks to support communities of common interest and collaboration without regard to location. 1963. "Memorandum for Members and Affiliates of the Intergalactic Computer Network". Advanced Research Projects Agency, April 23, 1963. 1967. "Televistas: Looking ahead through side windows". Report of the Carnegie Commission on Public Television, 1967, pages 201-225. 1967. "Computers Are Helping Scientists Locate That Particular Pebble in the New Avalanche of Information"
↑ Waldrop, M. Mitchell (2001). The Dream Machine: J. C. R. Licklider and the Revolution That Made Computing Personal. New York: Viking Penguin. p. 470. ISBN 0-670-89976-3. ↑ M. Mitchell Waldrop (2002). The Dream Machine: J.C.R. Licklider and the Revolution That Made Computing Personal. Penguin Books. p. 471. ISBN 9780142001356. Al Vezza was insistent, remembers Louise Licklider. "Lick had said that he didn't want any kind of to-do when he died", she says. "He wasn't religious himself, even though his father had been a Southern Baptist minister, so it would seem totally phony if he'd had a big religious service." ↑ Raychel Rappold. Biography. Rochester University. Retrieved 2015-08-08. ↑ H. Peter Alesso; Craig F. Smith. Connections: Patterns of Discovery. John Wiley & Sons 18 Jan 2008, 200 pages, ISBN 047019152X. Retrieved 2015-08-08. ↑ J. CHAMBERLIN. Psychologists's work and dreams led to the rise of the Internet. published by the American Psychological Association, April 2000, Vol 31, No. 4. Retrieved 2015-08-13. 1 2 Jay R. Hauben. "J. C. R. Licklider (1915-1990)". Columbia University. Retrieved March 30, 2011. ↑ Paul E. Ceruzzi (2012). Computing: A Concise History. The MIT Press. p. 75. ISBN 9780262517676. ↑ Ali Mazalek. "Man-Computer Symbiosis" Or How I learned to Stop Worrying and Love the Borg (PDF). published by Georgia Institute of Technology. Retrieved 2015-08-13. ↑ J. C. R. Licklider (April 23, 1963). "Memorandum For Members and Affiliates of the Intergalactic Computer Network". Washington, D.C.: Advanced Research Projects Agency. Retrieved August 19, 2013. ↑ ""Man-Computer Symbiosis" In MIT 150 Exhibition". 2011. Retrieved April 20, 2013. ↑ Raymond, Eric S. (2003). The Art of Unix Programming. p. 30. ↑ Licklider, J. C. R. (1951). "A duplex theory of pitch perception". Experientia (Basel) 7, 4, 128–134. ↑ R. D. Patterson; J. Holdsworth; M. Allerhand (1992). "Auditory Models as Preprocessors for Speech Recognition". In Marten Egbertus Hendrik Schouten. The Auditory Processing of Speech: From Sounds to Words. Walter de Gruyter. ISBN 3-11-013589-2. 1 2 3 Licklider, J. C. R., "Man-Computer Symbiosis", IRE Transactions on Human Factors in Electronics, vol. HFE-1, 4-11, March 1960. ↑ Licklider, J. C. R. (1965). Libraries of the Future (PDF). Cambridge, MA: Massachusetts Institute of Technology. p. 1965. ↑ "J. C. R. Licklider". The History of Computing Project. thocp.net. July 8, 2001. Retrieved August 7, 2011. ↑ Mohamed, Arif (March 2009). "A History of Cloud Computing". ComputerWeekly. Retrieved May 1, 2012. ↑ Johnson, Lyndon B. (November 7, 1967). "Remarks of President Lyndon B. Johnson Upon Signing the Public Broadcasting Act of 1967". cpb.org. Retrieved August 7, 2011. M. Mitchell Waldrop (2001) The Dream Machine: J.C.R. Licklider and the Revolution That Made Computing Personal ISBN 0-670-89976-3 - An extensive and very thoroughly researched biography of J.C.R. Licklider. Katie Hafner & Matthew Lyon (1998) Where Wizards Stay Up Late: The Origins Of The Internet, Simon & Schuster. ISBN 0-684-83267-4 - Describes the creation of the ARPANET. Augmenting Human Intellect paper, Douglas Engelbart, October 1962. Computer Networks: The Heralds of Resource Sharing video documentary, 1972. Licklider explains online resource sharing, about 10 minutes into the documentary, and reappears throughout. Seeding Networks: the Federal Role, Larry Press, Communications of the ACM, pp. 11–18, Vol 39., No 10, October, 1996. A survey of US government-funded research and development preceding and including the National Science Foundation backbone and international connections programs. Before the Altair – The History of Personal Computing, Larry Press, Communications of the ACM, September, 1993, Vol 36, No 9, pp 27–33. A survey of research and development leading to the personal computer including Licklider's contributions. Oral history interview with J. C. R. Licklider at Charles Babbage Institute, University of Minnesota, Minneapolis. Licklider, the first director of the Advanced Research Projects Agency's (ARPA) Information Processing Techniques Office (IPTO), discusses his work at Lincoln Laboratory and IPTO. Topics include: personnel recruitment; the interrelations between the various Massachusetts Institute of Technology laboratories; Licklider's relationship with Bolt, Beranek, and Newman; the work of ARPA director Jack Ruina; IPTO's influence of computer science research in the areas of interactive computing and timesharing; the ARPA contracting process; the work of Ivan Sutherland. Oral history interview with Robert E. Kahn at Charles Babbage Institute, University of Minnesota, Minneapolis, Minnesota. Kahn discusses the work of various DARPA and IPTO personnel including J. C. R. Licklider. Glenn Fowler (3 July 1990). "Joseph C.R. Licklider Dies at 75 - Foresaw New Uses for Computers". New York Times. Retrieved 28 June 2015.